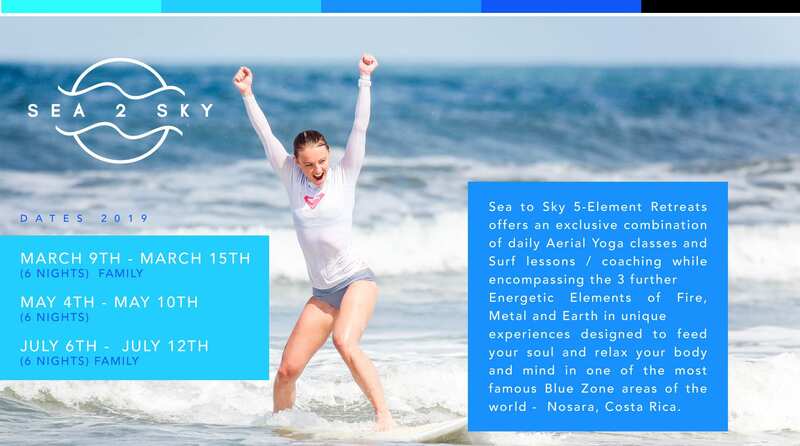 Sea to Sky 5-Element Retreats offers an exclusive combination of daily Aerial Yoga classes and Surf lessons / coaching while encompassing the 3 further Energetic Elements of Fire, Metal and Earth in unique experiences designed to feed your soul and relax your body and mind in one of the most famous Blue Zone areas of the world – Nosara, Costa Rica. Daily meals of delicious fresh and locally sourced cuisine prepared by the fabulous international chef at Bodhi Tree will leave you feeling nourished and healthy by weeks end. Like so many before ….you may never want to leave! Bodhi casitas have 6 casitas with 2 bedrooms that share 1 bathroom. Each bedroom has a king size bed or 2 twin beds. Our casitas have a small kitchen and a patio for you to relax after surfing or your areal yoga class. Hayley has been in the healing arts industry for over 30 years. First as a multi disciplined yoga teacher and Bodyrolling instructor and then obtained her DTCM in Acupuncture and Chinese Medicine. 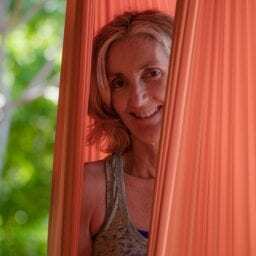 In 2009 she brought the unique style of Aerial Yoga to Costa Rica and has been the Aerial Yoga Master teacher in Nosara ever since. Hayley teaches all levels of Aerial yoga to all walks of life. “Any healthy person – any shape, age or size will be able to participate in Aerial yoga”. It is unique, fun and exhilarating and something most people have not tried yet. Find Hayley at one of either of the two aerial yoga studios on the Bodhi Tree Resort property teaching group or private. Del Mar Surf Camp was established in 2001 by María del Mar Alfaro in Jaco, Costa Rica. Her passion for sharing Costa Rica’s beauty and year-round surf lead to creating Costa Rica’s first native female-owned surf schools. They take pride in being the first and only Certified Surf School through the Costa Rican Tourism Board (ICT). All of Del Mar Surf Camp’s instructors are certified in CPR, First Aid and Water Rescue. They are also the only surf school with their Sustainability Certification.